I’ve been looking at Edinburgh through Outlander eyes recently. The Outlander series is a the historical/science fiction saga by author Diana Gabaldon which has recently been sparking a lot of interest due to the Starz Original television show based on the books. 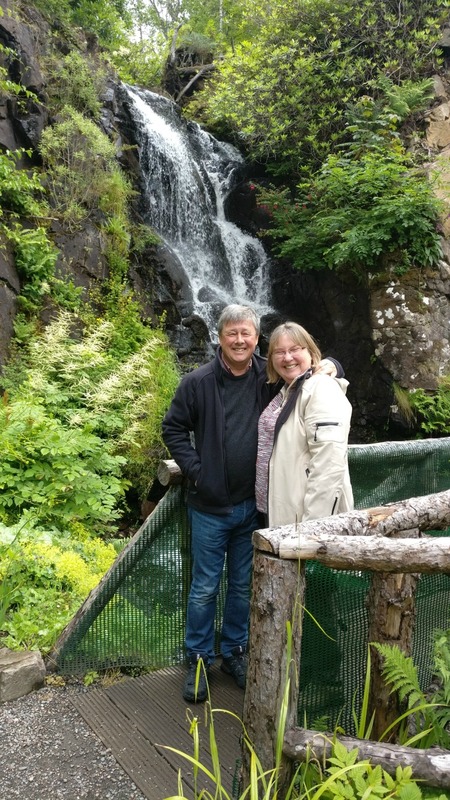 If you walk up the Royal Mile in Edinburgh from the Palace of Holyroodhouse, you won’t only be following in Jamie and Claire’s footsteps (in Dragonfly in Amber), but you’ll pass the Edinburgh residence of one of Jamie’s favourite authors. The middle shelf was given over to more light-minded reading: a small selection of romances, slightly ragged with much reading, featuring Robinson Crusoe; Tom Jones, in a set of seven small, leather-covered volumes; Roderick Random, in four volumes; and Sir Henry Richardson’s monstrous Pamela, done in two gigantic octavo bindings – the first of these decorated with multiple bookmarks, ranging from a ragged dried maple leaf to a folded pen wiper, these indicating the points which various readers had reached before giving up, either temporarily or permanently. A copy of Don Quixote in Spanish, ratty, but much less worn, since only Jamie could read it. At other times in the Outlander series (in A Breath of Snow and Ashes), we find Malva reading Smollett’s “The Adventures of Peregrine Pickle” to Marsali while she is in labour. 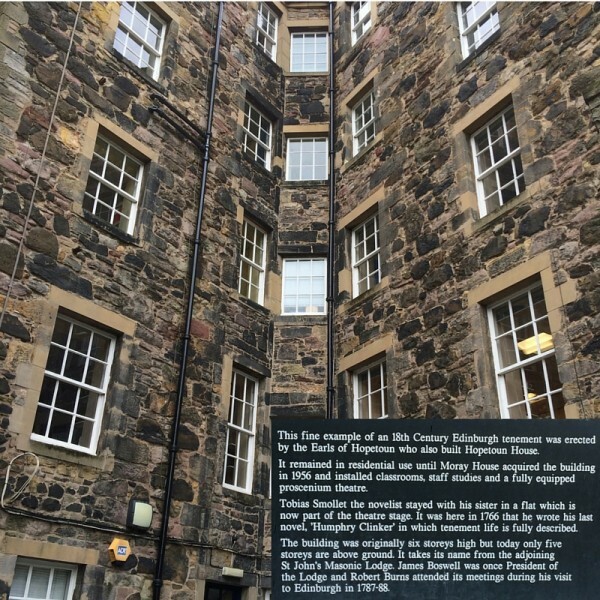 So, inspired by what Jamie was reading in Outlander, I set off on the trail of Tobias Smollett in Edinburgh. 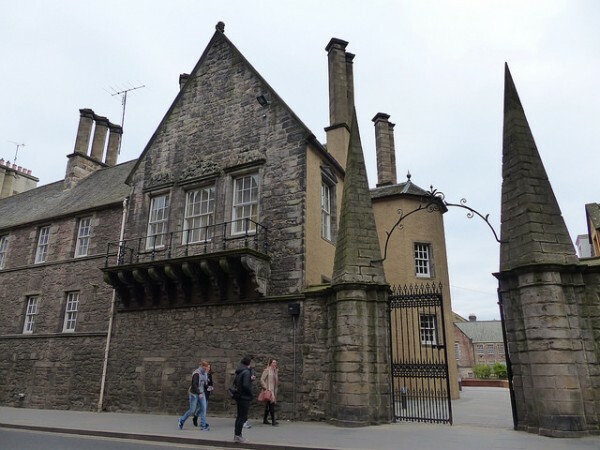 If you’re walking up the Canongate section of the Royal Mile, you’ll spot some gateposts topped with pyramid structures marking the entrance to Moray House, now part of the University of Edinburgh. Go in through the gates and turn to your right, where you’ll see this building: St John’s Land. On the nearby sign you can read that Tobias Smollett the novellist stayed with his sister in a flat which is now part of the theatre stage. It was here in 1766 that he wrote his last novel, “Humphry Clinker” in which tenement life is fully described. I decided to see if Jamie’s reading selection was something I’d enjoy. A quick search in the library catalogue, and I discovered that three of the aforementioned volumes were available to borrow. 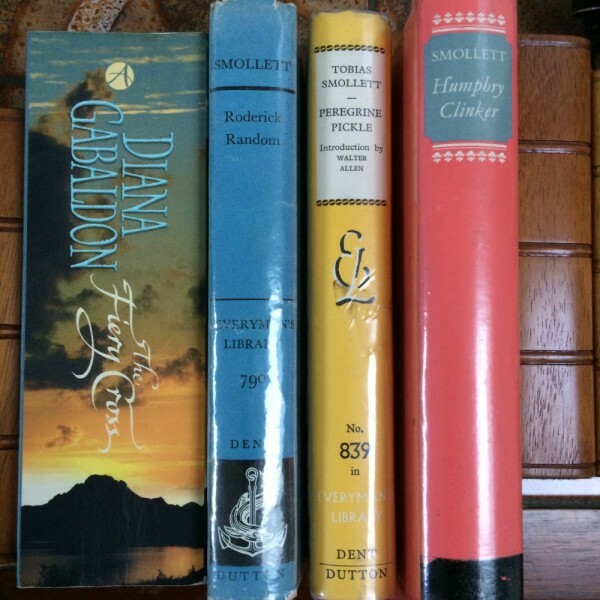 I thought I’d start with The Expedition of Humphry Clinker, the last of Smollett’s novels, published in 1771 (which means that our fictional hero, Jamie, would have been one of its first readers). In The Expedition of Humphry Clinker, a family group takes a journey from the borders of Wales, through England and up to Scotland. The novel takes the form of letters written by various members of the travelling party to their friends and relatives. This device allows us to see the reactions of both masters and servants to their travels. The letters include comments on social life, and descriptions of both urban and rural scenes. I approached the novel with some fear that I’d have real difficulty with the language, but found it not only accessible (with the benefit of footnotes), but also lively and entertaining. I’d therefore encourage you to go on the hunt for some of the books which Jamie was reading, and try some 18th century fiction for yourself. 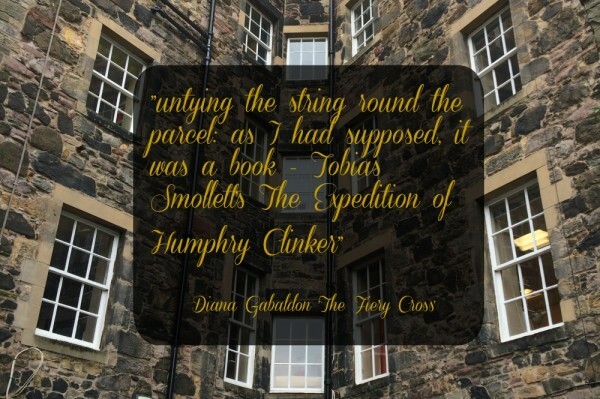 I’ve selected for you some of the favourite quotes from the Humphry Clinker on the Scottish section of his travels. It is very romantic, from its situation on the declivity of a hill, having a fortified castle at the top and a royal palace at the bottom. The first thing that strikes the nose of a stranger, shall be nameless; but what first strikes the eye, is the unconscionable height of the houses, which generally rise to five, six, seven, and eight stories, and, in some places, (as I am assured) to twelve. This manner of building, attended with numberless inconveniences, must have been originally owing to want of room. Certain it is, the town seems to be full of people; but their looks, their language, and their customs, are so different from ours, that I can hardly believe myself in Great-Britain. The water is brought in leaden pipes from a mountain in the neighbourhood, to a cistern on the Castle-hill, from whence it is distributed to public conduits in different parts of the city – From these it is carried in barrels, on the backs of male and female porters, up two, three, four, five, six, seven, and eight pair of stairs for the use of particular families – Every story is a complete house, occupied by a separate family; and the stair being common to them all, is generally left in a very filthy condition; a man must tread with great circumspection to get safe housed with unpolluted shoes – Nothing can form a stronger contrast, than the difference betwixt the outside and inside of the door; for the good-women of this metropolis are remarkably nice in the ornaments and propriety of their apartments, as if they were resolved to transfer the imputation from the individual to the public. I am not yet Scotchman enough to relish their singed sheep’s-head and haggice … the last, being a mess of minced lights, livers, suet, oat-meal, onions, and pepper, inclosed in a sheep’s stomach, had a very sudden effect upon mine, and the delicate Mrs Tabby changed colour; when the cause of our disgust was instantaneously removed at the nod of our entertainer. The palace of Holyrood-house is an elegant piece of architecture, but sunk in an obscure, and as I take it, unwholesome bottom, where one would imagine it had been placed on purpose to be concealed. The apartments are lofty, but unfurnished; and as for the pictures of the Scottish kings, from Fergus I. to king William, they are paltry daubings, mostly by the same hand, painted either from the imagination, or porters hired to sit for the purpose. ‘Have you noticed the pictures?’ I asked, wanting to change the subject. There were more than a hundred of them lining the walls of the Great Gallery, all portraits, all of kings and queens. And all with a most striking similarity. …The portraits, it seemed were all the work of a single painter, one Jacob DeWitt, who had been commissioned by Charles II, upon that worthy’s restoration, to produce portraits of all the King’s ancestors, from the time of Robert the Bruce onward. …DeWitt had painted furiously, completing one portrait every two weeks in order to comply with the monarch’s demand. The difficulty, of course, was that DeWitt had no way of knowing what Charles’s ancestors had actually looked like, and had therefore used as sitters anyone he could drag into his studio, merely equipping each portrait with the same prominent nose, by way of ensuring a family resemblance. Hard by, in the fields called the Links, the citizens of Edinburgh divert themselves at a game called golf, in which they use a curious kind of bats, tipt with horn, and small elastic balls of leather, stuffed with feathers, rather less than tennis balls, but of a much harder consistence – This they strike with such force and dexterity from one hole to another, that they will fly to an incredible distance. Of this diversion the Scots are so fond, that when the weather will permit, you may see a multitude of all ranks, from the senator of justice to the lowest tradesmen, mingled together in their shirts, and following the balls with the utmost eagerness – Among others, I was shewn one particular set of golfers, the youngest of whom was turned of fourscore – They were all gentlemen of independent fortunes, who had amused themselves with this pastime for the best part of a century, without having ever felt the least alarm from sicknesss or disgust; and they never went to bed, without having each the best part of a gallon of claret in his belly. Such uninterrupted exercise, co-operating with the keen air from the sea, must, without all doubt, keep the appetite always on edge, and steel the constitution against all common attacks of distemper. … I have met with more kindness, hospitality, and rational entertainment, in a few weeks, than ever I received in any other country during the whole course of my life. 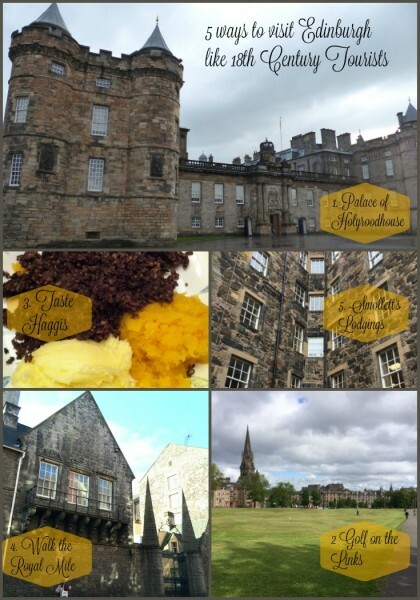 And of course keep up with Outlander Kitchen!